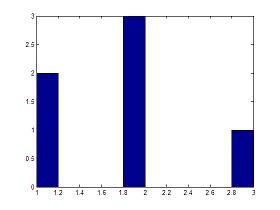 The hist instruction in Matlab, without output arguments, produces a histogram bar plot of the results. The bar edges on the first and last bins may extend to cover the min and max of the data unless a matrix of data is supplied. A histogram is a graphical representation used to estimate the probability distribution of a variable. It counts the frequencies of data into discrete intervals (bins), and then plots a rectangle over each interval. 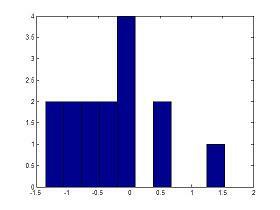 This Matlab code creates a histogram with 3 bars. The first bar has two '1' values, the second bar has three '2' values, and the third bar has one '3' values. The horizontal axis has the different values in the vector to be plotted. The vertical axis has the number of those values in the vector. This Matlab code generates a histogram of 15 randomly distributed numbers between 0 and 1 (you can type 'help rand' on your command window to learn about random numbers). Note that each column includes a range of values, otherwise the histogram would contain 15 bars. You can type ' help hist ' or ' help bar ' on your command window to see more details of use.